MK comments (? Jul 2003): My memories of Lt Leroy Bunders are a little clearer than his of mine. This may be because, from February until June of 1952, he, as the Platoon Leader of Co A's 2nd Plt, was the officer nearest above me in the chain of command and I was only an ammo bearer, an assistant gunner, and then a gunner in the 4th Squad of his 2nd Platoon. 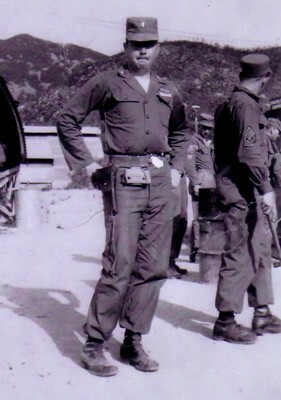 It was only after he and our CO, Cpt Lendon P. Pearson (#11), left Co A in June of 1952, that I became an assistant squad leader and then a squad leader of the 4th Squad. 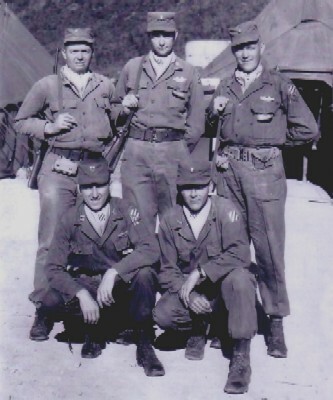 I am sure that Lt Bunders, who likes to be called "Roy" (a name by which I can not get used to addressing him), will remember much better the two men who proceeded me as the squad leaders of the 4th Squad: Sgt Van Goshen and, later, Sgt Negrete. 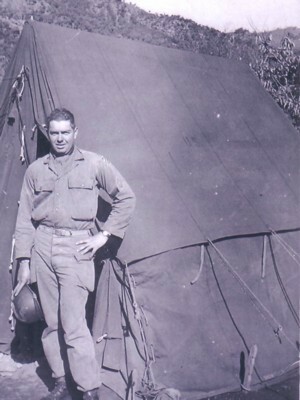 The two photos first below were taken when Roy was still in Co C, 15th Inf Rgt, 3rd Inf Div. The left one was taken in January of 1952 while Roy was the First Sergeant of Co C. The right one was taken later, after Roy had been promoted to 2nd Lt, and is of the Co C officers. In the back row (left to right) are Lt Bunders, the Warrant (Administrative) Officer, and Lt Mara. In the front row (left to right) are Cpt Fowler (CO), Lt Wayne Williams as in "wabbit" (Roy's quote of Wayne). To see Co A officers at about the same time, visit Captain Pearson's Stars. The next two photos were taken during an incident very familiar to me - in fact, I am fairly certain that, in the left-hand photo, I am the guy in the last row and to the right. Lt Bunders is leading the parade and and the photo was taken while we were marching some refugees the rear. We had rescued them from just across the Imjin a little earlier in the morning. Their rescue occurred the morning after the night during which they had made us very nervous by attracting our attention with yells, in Korean, from across the river. More of that story is told and other photos of the same parade may be seen on the (one of my favorites) Refugees, Snyder, Key , and a Goat and the Refugees Plus - Again pages. 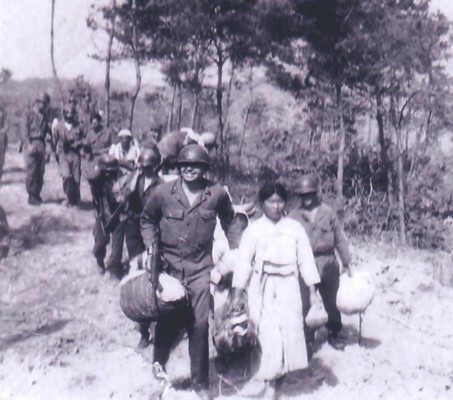 On the back of the photo just above and to the right, Lt Bunders says, "Miss Korea contest - to the rear, the judges" and remembers that the photo was taken near the small knoll we knew as Hebert Two shortly before the refugees were brought (using the boat and rope ferry across the Imjin) over to the MLR. I think that the water pool may be the same one that can be seen in the photo of Kelly (taken about fifty years later). Click on the Kelly link and decide for yourself if I'm right. Lt Bunders says that the shot to the left was taken in late April or early May at the UN Reception Command in Pusan. 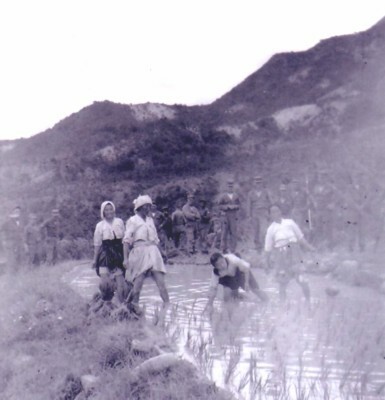 This was at the time when the 1st Bn of the 15th was guarding the POW camp near Pusan. Lt Bunders is front and center and to his left is Co A's 1st Sgt Welcome. Before they came to Korea, they had been together at Ft Riley, Kansas. There, Lt Bunders (then not an officer) had been a demonstrator for Sgt Welcome during his bayonet instruction classes. They later served together at Ft Leonard, Missouri. How's that for a series of coincidences?